Irresistible Leek Risotto: this creamy risotto with leeks, roasted cumin and cuban spices is a smoky sensation. 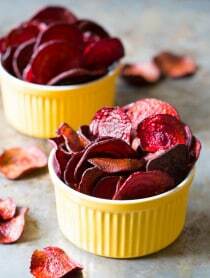 Serve it on it’s own, or as a side dish. Either way, it will be the talk of the table. 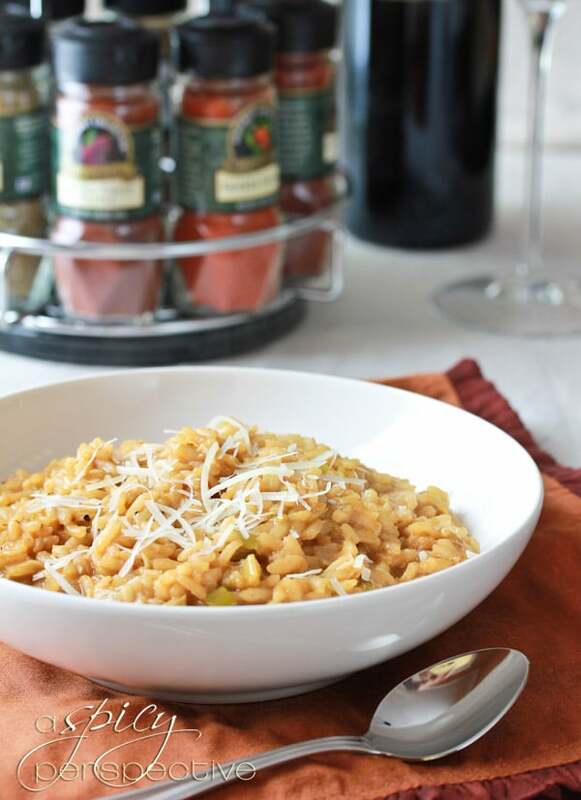 What’s more comforting or luxurious than a silky serving of risotto? Arborio rice is the glass slipper of the grain family. 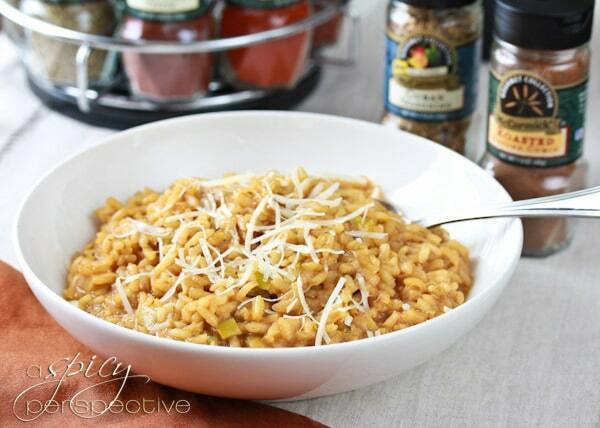 It transforms a plain rice pilaf into a fabulously rich risotto dish with a creamy, yet firm texture. Risotto makes a lovely canvas for any flavor. This risotto with leeks is bright and earthy, with deep smoky undertones from McCormick Roasted Ground Cumin and Cuban Seasoning. The vibrant spices make this leek risotto a standout at the dinner table. Smoky Leek Risotto was served at the McCormick Gourmet Dinner Party I threw last week. Make sure to check out the other recipes on the menu. 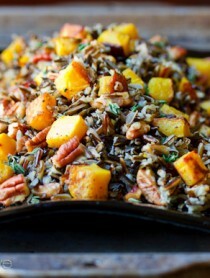 Or click here to see the McCormick Gourmet Dinner Party Chain! Place a large sauce pot over medium heat. Add the butter, oil, chopped and cleaned leeks, cumin and the Cuban Seasoning. Saute 3-5 minutes until the leeks soften. Heat the stock in another sauce pan or in the microwave. Keep warm. Add the rice to the leek mixture, followed by the white wine. Stir and simmer until the wine absorbs. Add 1 cup of stock at a time, stirring and allow it to absorb into the rice before adding more. This should take 15-20 minutes until all the stock is incorporated and the rice is “al dente”. When the rice is tender and creamy, stir in the Parmesan cheese. Salt and pepper to taste. I am obsessed with leek. 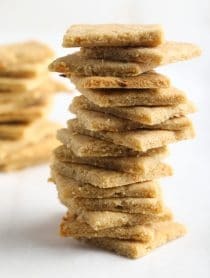 Always looking for new ways to incorporate them into my recipes. This looks delicious. Thanks! I love risotto and love smoke. what a great combination. will definitely try this one. I have never seen McCormick’s Cuban Seasoning before. I guess they don’t sell it here in my area of NJ. I would never think of using cuban seasonings in risotto. Sounds very good though. I adore risotto and make it at least once a month. I want a whole bowl right now. Oh my goodness! This looks amazing!! I have never tried risotto, but definitely will soon!! I am fairly new to making risotto, but boy do I love it! I know I would love this one. Yum! Making risotto at home has been on my “to try” list for awhile now. Definitely need to make this! I love the earthy savory flavor of leeks! 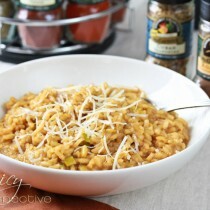 this risotto is right up my alley! Please do drop by the Auction fundraiser to help VSPCA,India on my blog, to bid or share. Shipping is available in US, India, and some international. Its a wonderful org rescuing all animals like farm sanctuary and also feeding the homeless. oh dear lord i love leeks! Um, yes times a billion.